Hawai‘i is the most dangerous state for pedestrians over the age of 65. Less than 30% of Hawai‘i public school students, grades 6-8, are active for at least 30 minutes per day. Over 50% of adults in Hawai‘i are overweight or obese. Complete Streets are streets for everyone. Pedestrians, bicyclists, motorists and public transportation users of all ages and abilities should be able to safely move along and across a complete street. This benefits community health by increasing opportunities to safely bike and walk to destinations such as transit, work and parks. 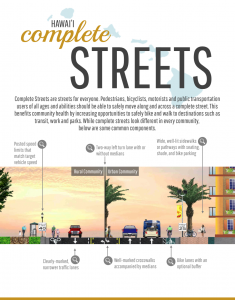 While complete streets look different in every community, below are some common components. Well-marked crosswalks w/ short crossing distances Clearly-marked crosswalks make it clear to both pedestrians and vehicles where crossing should take place. Shorter crossing distances decrease pedestrian exposure to vehicle traffic and make crossing easier for seniors and those with physical disabilities. Clearly-marked, narrower traffic lanes Various studies show that wider traffic lanes result in less attentive driving and speeding. Narrower, clearly-marked traffic lanes slow down traffic and help drivers “stay inside the lines”. This reduces both vehicle-on-vehicle accidents and vehicle-pedestrian crashes. Bike lanes or multi-use paths with optional buffer Bike lanes designate a safer lane of traffic for bicyclists. This moves them out of regular traffic lanes and off of sidewalks, which results in less fatal and non-fatal accidents. 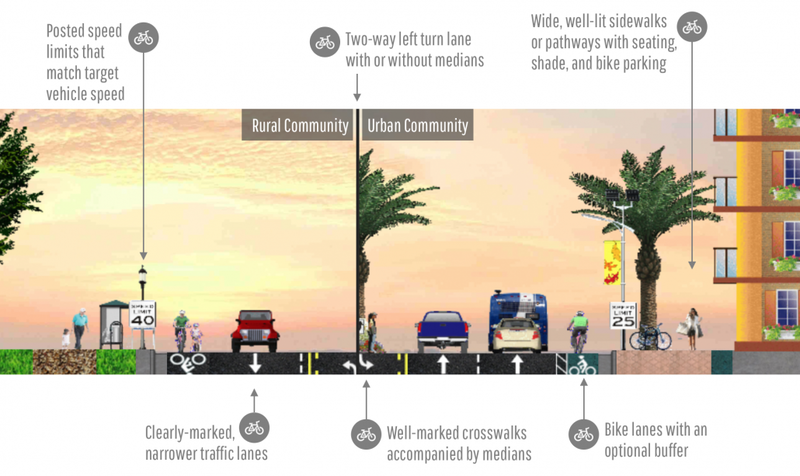 Multi-use paths achieve the same goal, but are designed for a variety of users, including bicyclists, pedestrians and skateboarders. Buffers add additional protection for cyclists. Complete Streets look different in every community. The needs of rural towns will different from those of urban cities. Below are some examples of inspiring Complete Streets projects from across the country. 2. Behavioral Risk Factor Surveillance System, 2015. 3. Youth Risk Behavior Surveillance System, 2015.